Lock in a great price for Hotel Market – rated 8.2 by recent guests! Morning breakfast very good. Bar good and friendly. Good staff. Our room was very nice---just as advertised. 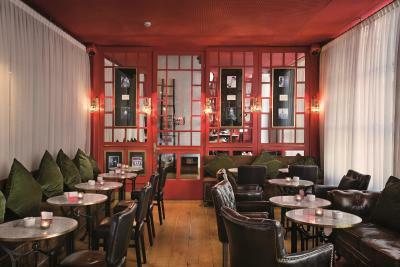 The hotel had a vintage feel with a flare of modern, which created a wonderful ambiance. Breakfast was great and ample choices. 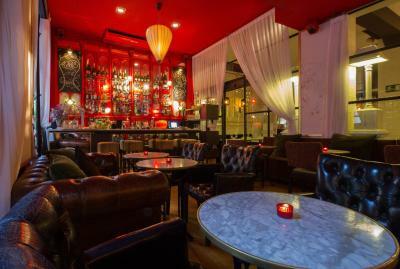 The location was close to a metro station and easy walk into the city center. There were many restaurants in walking distance. The bar downstairs was awesome and enjoyable. Breakfast is great. Staff are great specially the ones that clean the room. I like that it’s close to convenient store and small restaurant and bar. The room was very comfortable and the terrace was great. Easy access to bus and metro but also close enough to walk to attractions. The staff was great and the breakfast is delicious! The room was confortable enough, very good value for money. Hotel Market This rating is a reflection of how the property compares to the industry standard when it comes to price, facilities and services available. It's based on a self-evaluation by the property. Use this rating to help choose your stay! One of our top picks in Barcelona.Hotel Market is located next to Barcelona’s San Antonio Market, 10 minutes' walk from MACBA Gallery. 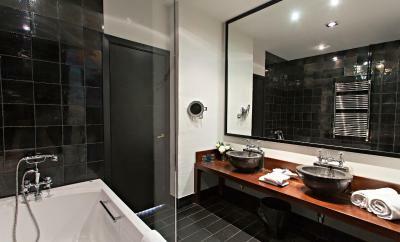 Its chic rooms have rain showers and free Wi-Fi, and there is a popular restaurant. 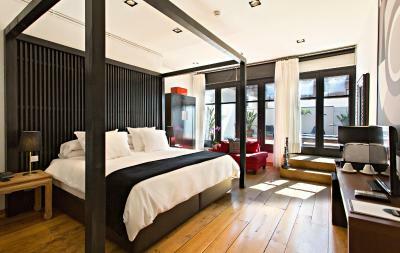 The Market Hotel’s modern rooms have dark wood beams, white walls and large windows. Each one has a private bathroom. Some rooms have a balcony or terrace. 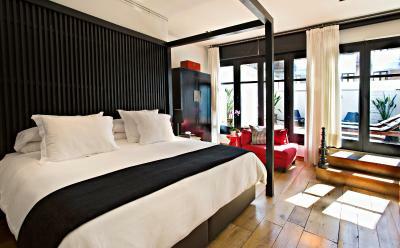 The hotel is 15 minutes’ walk from both Plaza Espanya and Plaza Catalunya. 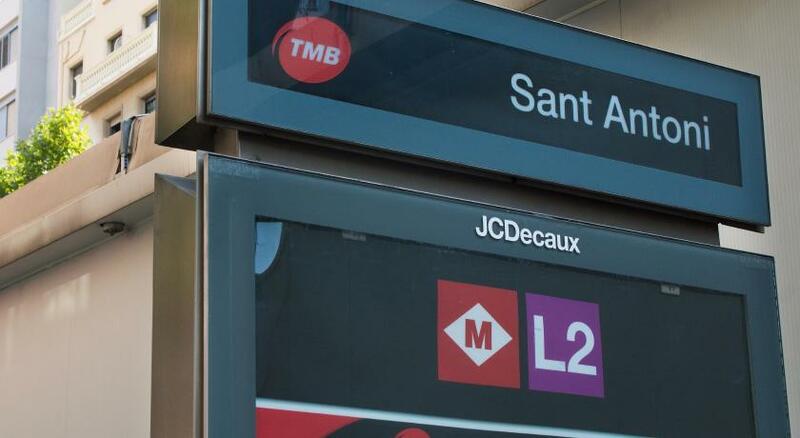 Sant Antoni Metro Station is about 650 feet away, and an airport shuttle bus stop can be found 2 minutes’ away. 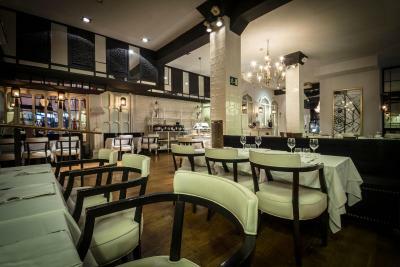 The Market Hotel’s elegant restaurant offers a range of modern Catalan dishes, and specializes in rice. When would you like to stay at Hotel Market? Air-conditioned room with flat-screen satellite TV and a safe. The private bathroom comes with a hairdryer and toiletries. 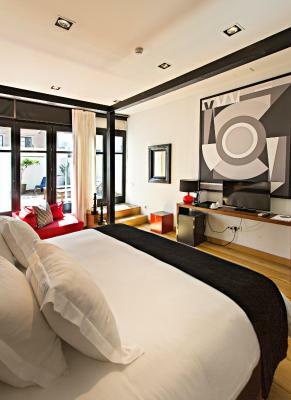 Featuring a large, furnished terrace, this bright suite includes a free mini-bar service. It has an private bathroom with a double sink and hairdryer. Air-conditioned room with a flat-screen satellite TV and a safe. The private bathroom comes with a hairdryer and toiletries. House Rules Hotel Market takes special requests – add in the next step! Hotel Market accepts these cards and reserves the right to temporarily hold an amount prior to arrival. Though it didn't bother me too much, the hotel walls are very thin. Breakfast, simple and good quality eggs and bacon. 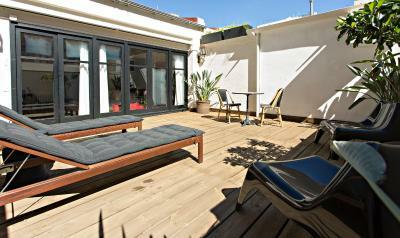 Location, walking distance form La Ramblas, metro station and a really nice market. 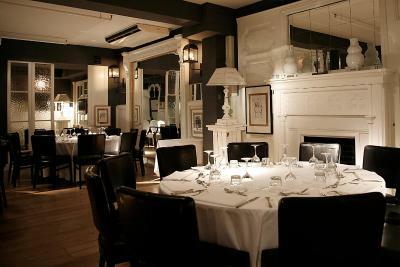 Plus there are 100's of really nice restaurant to eat. Too much noise! We could hear every word from next door. Lots of noise at midnight! The decor is very tired and the hotel needs an update. 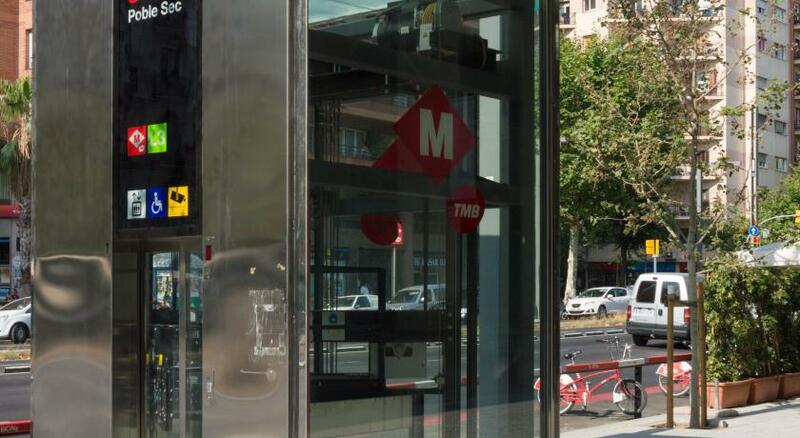 Location of the hotel is good as 15 to 20 minute walk to Plaza Catalunya. Residential area close to indoor market. There is a book market held every Sunday. Quiet and authentic area. The hotel has comfortable beds but rooms are small, but nice bar and restaurant. Not very suitable for families with small children ( we have 2years and 1 year) room is very small and there is no space. It’s nice hotel for couples. Good design in the hotel and nice location. Tasty breakfast with different choice. my friend's room on the top floor with the terrace was amazing! The stuff was friendly and helpful and perfect location. Great location within local community. So much on doorstep. I only had two issues with the hotel. The first was that the hallway to the suites had a foul smell. Second the walls to the rooms are paper thin and you can hear the neighbors as if they were in your own room. Other than that the hotel was great. The first night we checked in our bathroom had no cold water so we ended up having to change rooms. A little noisy along the corridors above,below, and immediately outside the rooms because of the wooden flooring . Great cocktail bar . Good decor throughout and great shower. Very clean . No tea or coffee facilities, no English television, more bins needed, could hear other guests through walls.